Escaping the chains that bind us - that is the pleasure of driving. What's more , any of YOKOHAMA's .drive series of tyres, incorporating ground-breaking technological excellence and outstanding performance, would be the ideal partner when makeing you bid for freedom. At heart, though, it's about pleasure. Pure and simple driving pleasure. That's why we named the new series .drive. You can't get much purer or simpler than that. Spirited, sure-footed and sports car oriented – the S.drive™ tyres give drivers the confidence to extract the very best from their cars. 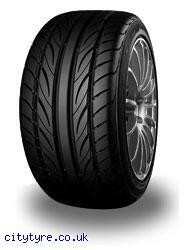 The design for the tread pattern of the S.drive™ is a result of YOKOHAMA`s advanced simulation technology. The innovative Variable Angled Groove that optimizes tread contact with the road provides dramatically enhanced traction while cornering. To cope with constantly changing contact conditions in a very pro-active manner, YOKOHAMA has developed through its in-house technological skills, a new Micro Flexible Compound that is responsive to undulations in the road surface at the nano level. In comparison with the original MF compounds, the addition of extra silica has further enhanced driving in the wet, while extra polymer has improved performance when it’s dry.